Screenshot of BRWA website showing registered areas of indigenous territory in Sulawesi, and details of Anoi territory in green. Q: Heru Prasetyo, Indonesia’s REDD+ Task Force Secretary, told REDD-Monitor that Indonesia’s One Map ‘movement’ originated in 2010, when the President’s Delivery Unit for Development Monitoring and Oversight (UKP4) showed President Susilo Bambang Yudhoyono how maps from KLH and Dephut for forest cover were not the same and he instructed that one map be created. Can you tell us anything more about where the idea of the policy came from and what is the rationale behind it? A: This is quite strange: two ministries issue different maps covering the same thing, i.e. forest cover. It implies that there are different policy directions and that there is different decision-making about land and forest cover in Indonesia. This begs the question: which map is the right one? From what I see, the background to President SBY’s instruction is Indonesia’s climate change programme which is going to be implemented with support from other countries. Q: Why is mapping a hot topic in Indonesia right now? Is it related to the 2011 Moratorium or is it a wider issue? A: It’s true that mapping is very closely related to the 2011 Forest Moratorium. I see the moratorium map as an entrypoint for UKP4, whose task it is to supervise development from the governance and law enforcement side. It’s not just the forestry sector but other sectors too, that need to be addressed so that the same data and the same map is used across the board - mining, plantations and so on. We are also looking at the relationship with Indonesia’s economic development acceleration plan, as set out in the MP3EI, as there is almost equal momentum for both of these agendas. Q: What will the map being developed by UKP4 eventually show? For example, will it only include official data from the various relevant ministries (forestry, plantations, land, mining & energy etc) or will it also show information about the customary land owned by indigenous peoples in Indonesia? A: This has been the focus of our attention during the several meetings we have had with UKP4 in a special forum to discuss One Map as well as in other UKP4 fora. How will the maps of indigenous territories really fare in the One Map policy? We hope indigenous territory maps will be become part of the reference for policies and legislation in forestry and other sectors, including climate change and REDD+. Then the thematic maps made by government ministries and agencies, for example maps of licensed areas, HGU concessions and maps of indigenous territories can be displayed by the institutions with the authority to do so, such as the Geospatial Information Agency (Badan Informasi Geospasial -BIG), and can be viewed by the general public. Q: Who is leading the development of the One Map? Is it a good process in terms of CSO involvement and public consultation? What has your involvement been? A: Currently UKP4 is leading, and has given BIG the task of preparing the system infrastructure and the standardization of the existing maps, including maps of indigenous peoples’ territories, so that all thematic maps from each sector, plus the indigenous maps, can be integrated. Civil society involvement has been going quite well, in my opinion. This started with the official acceptance of the indigenous territory maps that were handed by JKPP and AMAN to UKP4 and BIG on November 14th. There are 265 maps of indigenous territories, covering an extent of 2.4 million hectares, transferred for processing into part of the Indonesia One Map. Now, together with BIG, we are preparing a participative mapping guide so that indigenous territory maps can be made according to a Community Spatial Data (DSM) standard, to contribute to the One Map. Also, the REDD+ Taskforce is carrying out a project to acquire existing thematic maps and licences in the provinces which have been selected as REDD+ pilot provinces. I’ve just been to a meeting about this in South Sumatra. The South Sumatra government there, through the provincial planning office and BIG and the Participatory Mapping Service Node NGO group, is preparing a policy and mechanism which will enable DSM to contribute to the One Map, in this case in South Sumatra. Q: According to ArcNews the Japanese government's Japan International Cooperation Agency provided a loan to the Indonesian Geospatial Information Agency to carry out the one map work, while NTT Data, a Japanese-owned company is overseeing implementation. Why do you think Japan is interested in funding this initiative? A: The information I got from the director of BIG at one of the meetings was that the agency is working together with ESRI to develop the BIG portal because the company has good experience and capacity. As regards funding from the Japanese government to develop the Indonesia Geospatial portal, this does need to be looked at as it seems that there is widespread concern that strategic information on Indonesia will be accessible to external parties. There are also concerns about an American initiative through the Millennium Challenge Corporation (MCC) to support village border mapping, working with district and provincial governments. Q: What have been the main contentious issues in debates about how the map should be developed? A: These are sensitive issues, to do with different sectors and their egos. Each sector has a thematic map which is the main reference used when issuing licences. So the corrupt practices related to licensing which go on in the ministries and agencies with the authority to issue those licences thrive where the common reference maps are unclear or where there are no common reference maps at all. It’s certainly no easy task to unify all ministries and agencies that produce thematic maps for their sectors. Another issue is that existing participative maps or maps of indigenous territories need to be “standardized”, in their geometric aspects for example. Q: If the main purpose of the map is to clear the way for more investment, the policy could well accelerate landgrabbing, couldn’t it? But, if there is open public access to the map, local people will be able to see what is planned in their areas and prepare themselves better to oppose developments that will affect them negatively. What is your view of the potential positive and/or negative impacts of the development of one map? Do the dangers outweigh the benefits or vice versa? A: Getting indigenous peoples’ maps in the official geospatial information, getting their information out there, is an opportunity, as I see it. The current situation, where there is no clarity, where there are no common thematic reference maps for the government and for communities, has created a mess for natural resources management and widespread agrarian conflict. If the indigenous territory maps can be made into one thematic map that gets the same level of support as other thematic maps, then the overlapping tenures will become clear. It means the government will have recognised that there are tenurial problems that need to be sorted out. Landgrabbing has been going on in Indonesia for a long time, one of the causes being the sectoral maps and the lack of recognition for indigenous territories. The One Map is not an instant cure-all for land management injustices and agrarian conflict. It is just one basis for government decision-making which will of course be influenced by other factors beyond the power of the map itself, including political factors, and the way this country is managed in terms of policies and leadership. As an initiative to clarify spatial data references for decision-making, in my opinion, the One Map policy deserves some respect. At the same time, we should remain critical and get on with the job of preparing community spatial data. Q: The portal for the “Geospasial untuk Negri” map is at http://maps.ina-sdi.or.id/home/. Is this the best place to go to for information on land use in Indonesia? What other sites and resources do you recommend? A: This is the portal being developed by BIG. It is where the indigenous territory maps will appear on their own dedicated page. Putting aside the question of how comprehensive the information and data available here is, I think it’s really good that this one portal has started displaying all the basic maps and thematic maps. 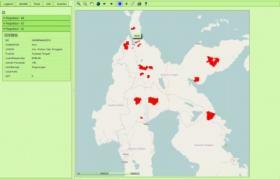 The Forestry Ministry also has a web-GIS on forestry. Q: How does the One Map policy relate to, or affect the work of JKPP and that of BRWA? A: The One Map policy has provided important momentum for JKPP and BRWA to communicate about the existence of participative maps and indigenous territories to the government. It means that community maps don’t just make an appearance or become needed when there is a conflict, but also when there are decisions to be taken which affect communities living in a targeted area. Q: What would you like to see happen next to the one map policy? A: I hope the standardisation process for participatory mapping by BIG pays attention to uniqueness of participatory mapping and doesn’t just get caught up in the technicalities. Also future political changes and the fact that UKP4 will come to the end of its legal existence in 2014 (the end of President SBY’s period of government), mean that policies which protect the rights of indigenous peoples to their territories and lands need to be prepared.